Leadership not deeply rooted in a foundation of truth is leadership destined to fail. 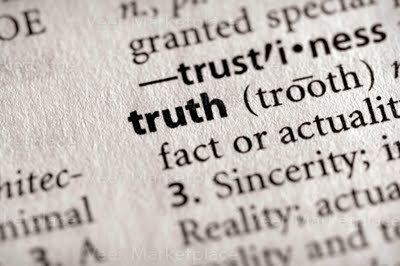 The reality is the best leaders are also absolutists when it comes to truth – they view truth as a non-negotiable. However in the wake of some of the recent, and highly publicized business, financial, and political scandals, it’s not too difficult to understand how some may actually question the existence of truth in business or government. If you peel back the layers on most of the debacles that often transform themselves into highly sensationalized headlines, you’ll see they often begin with rationalizations, justifications, posturing, and spin being substituted for the truth. In today’s column I’ll address the often overlooked benefits of truth telling as a key success metric. I think sometimes we all need to revisit reality and examine why we do the things we do. Truly great leaders view business as a no spin zone. The most successful business leaders of our time have built their reputations by letting right thinking, right decisioning, and right acting serve as their guide. If you have to manipulate the truth to gain an advantage, the advantage is not worth the perceived gain, for any advantage gained in deceit will surely come at a very high cost – the sacrifice of your honor and integrity. While there is not an adult breathing today that hasn’t told a lie or dealt in shades of gray at some point in time, not everyone is pathological liar. What most people learn as they spend time in the refining fires of life is truth requires great courage. It was Goethe who said, “character develops itself in the stream of life.” The harsh reality is it’s incredibly difficult to recover from a breach of trust, and many never do. While everyone makes mistakes, and most deserve a second chance, it’s just easier to tell the truth than to spend years attempting to rebuild. A key difference between those leaders who succeed and those who fail is whether they are known for their honesty or lack thereof. One of the best traits you can possess as a leader is to be known for your candor. Whether in written or oral form, communication that is clear, concise, on point, and truthful will gain the respect and admiration of peers and subordinates alike. While many wannabe leaders possess the ability to selectively self-edit on the fly as they wax eloquent for the purpose of persuading their audience, true leaders understand that all the justifications and rationalizations in the world cannot replace the value of the truth. 1. Telling the truth is a habit. For those not grounded in the truth you’ll find that it requires practice. It was Einstein who said, “weakness of attitude becomes weakness in character.” Each truth-telling event strengthens you for another, and each one gets easier until telling the truth becomes second nature. It is never too late to start telling the truth. Regardless of whatever your past indiscretions might be, you can change your future by beginning to tell the truth today. Truth is a habit well worth forming. 2. Telling the Truth is the right thing to do. Lying is wrong. It’s just that simple, and oh by the way, omitting, editing, spinning, blurring or repurposing the truth is also wrong. Selective truth telling is synonymous with being a liar. Resist any form of deceit or manipulation if you want to achieve sustainable success. 3. The heaviest baggage you can carry is a lie. By opting not to tell the truth you are simultaneously opting to take on the heaviness of the burden of deceit. Each time you encounter a person, circumstance, or situation that reminds you of the untruth, your conscience will weigh you down as you become a fugitive in your own mind running from the lie you told. 4. Lies will always come back to haunt you. We’ve all witnessed some fairly elaborate cover-ups, and as we’ve all seen they always turn out the same way… in disasters that could have been avoided had the truth been told to begin with. You might be able to run, but you can’t hide from your lies. While you might be able to conceal your deceit for a time, your lies will always resurface at some point in the future…it may be a week, a month or a decade but they will find you out. 5. Lies create a barrier to personal and professional development. Time, energy and worry are often spent on hashing and rehashing wrong acts and untruths. Instead of wasting resources on fruitless endeavors, you could be investing in transacting business, building relationships, learning, or any number of other positive things. 6. Truth strengthens your reputation and enhances your personal brand. If you consistently and effortlessly tell the truth a strange thing happens; other people will notice. You will quickly earn the respect of others by becoming known as a person of character and integrity. There is no more valuable mental association you can tie to your personal brand than that of integrity. 7. Truth deepens the quality of relationships. There is a distinct difference between the surface level acquaintances who will gravy-train your success and the deep professional relationships and true friendships who will endure the test of time regardless of circumstances. 8. A clear conscience leads to a healthy mind. It’s a nice feeling to be able to look at yourself in the mirror each morning and actually like what you see. I don’t know about you, but I have better things to do than try and remember all the different stories that I’ve told to people. The truth is a gentle, healing practice that keeps your conscience clear, provides you with a positive outlook, and a confident & formidable presence. 9. Truth is a powerful example. As a leader you have in fact chosen to be a role model, and as such it is incumbent upon you to model the truth. When friends, peers, subordinates, competitors, vendors, partners, suppliers, investors, lenders, etc. see that you actually walk the talk, you will not only have earned their confidence and respect, but you’ll find that they will also try to model that behavior. I think the Bible says it best: ”The truth will set you free.” It has been said a person is only as sick as their secrets, and I would strongly encourage you to be honest and forthright in your communications and actions as you’ll be healthier, happier and more successful.